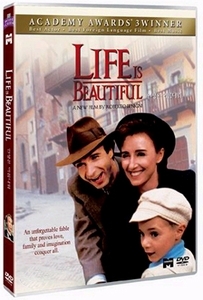 Conjuring keys and hats out of thin air, Guido (Roberto Benigni), a clever Jewish-Italian waiter, successfully courts Dora (Nicoletta Braschi), a beautiful local woman, in Fascist pre-WWII Italy. His life, however, is turned upside down a few years later when he, Dora, and their young son, Giosu? (Giorgio Cantarini), are sent to a Nazi concentration camp. Refusing to give up hope, Guido tries to protect his son's innocence by pretending that their imprisonment is just an elaborate game, with the grand prize being a tank.